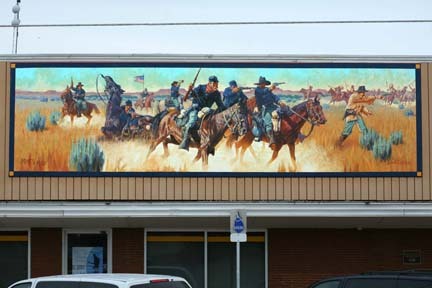 This mural depicts an armed conflict that pitted the U.S. 4th Cavary against Dull Knife and warriers of Northern Cheyenne. The engagement occurred 25 miles northwest of Alva on September 13 and 14, 1878. 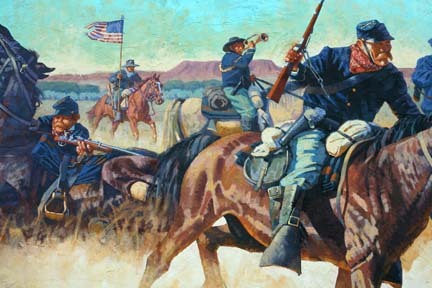 In this battle, the Cavalry had to retreat in panic to Fort Supply. The presiding officer was later court marshalled. 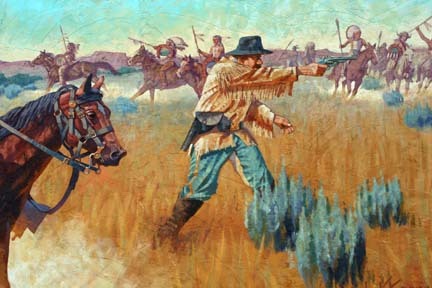 The Cheyenne continued their journey back to their homelands in Wyoming and South Dakota, with other skirmishes with the Cavalry along the way. Read more about the Battle of Turkey Springs.